I’m preparing a post now on my recent David O. Selznick weekend, but before I get to that, an intriguing mystery has come up. Here is a photograph I picked up two days ago in an antique shop in Ashland, Oregon. The proprietor of the shop wasn’t able to tell me any more about it than I was able to deduce from looking at it — in fact, much of what he told me was at a variance from what I did deduce. Above the stamp is handwritten in pencil: “Larchmont Yacht Club 1930”. Next to the date, also in pencil but sideways, is the number “13” in a circle. The shop owner asserted that the signature reads “John Berryman”, but it clearly says “John Barrymore”. I got the distinct impression that the name John Barrymore meant absolutely nothing to him. 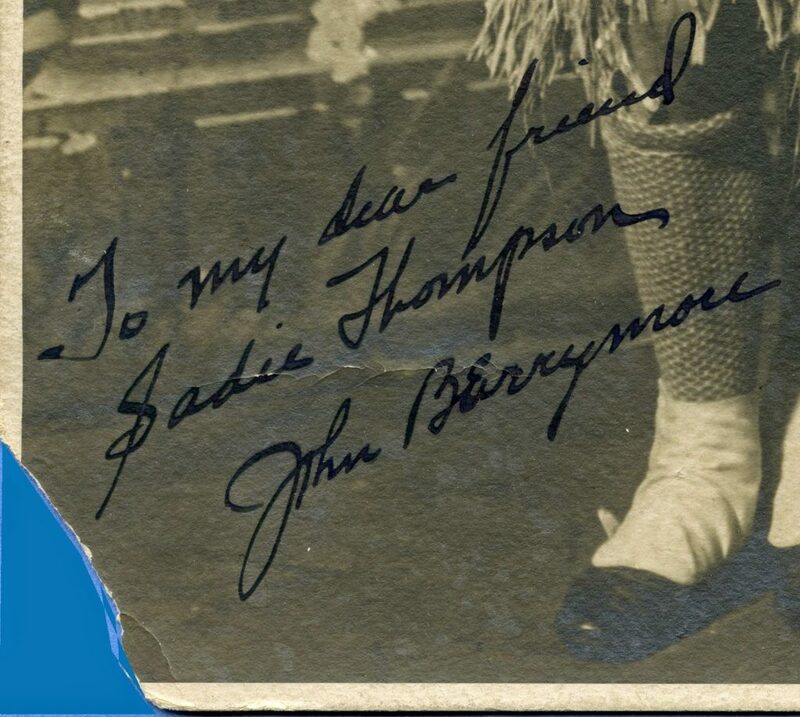 I was able to find online several examples of John Barrymore’s autograph, and it must be admitted that most of them bear only a slight resemblance to the signature on the photo. However, most of them appear to have been scrawled in haste, no doubt as Barrymore was accosted on the street or in a restaurant and asked to sign someone’s autograph book; the photo, on the other hand, appears to have been inscribed at leisure and with some care. Personally, I’m satisfied that this is an authentic John Barrymore autograph — because I’m satisfied that the man in the photo is John Barrymore himself. Grotesquely made up, granted, but still easily recognizable. The shop owner had the photo labeled “Vaudeville Photo 1920’s” and said it was of two vaudevillians in their stage costumes. I disagree. To me, there can be no doubt that the photo was taken at a costume party at the famous Larchmont Yacht Club in Westchester County, NY sometime during 1930 — Halloween, perhaps. As for the inscription to “my dear friend Sadie Thompson” — well, that can only refer to the central character in Rain, the play by John Colton and Clemence Randolph based on W. Somerset Maugham’s story “Miss Thompson”; the idea that Barrymore, or anybody else for that matter, actually knew somebody by that name is patently far-fetched. It’s far more likely that this is a playful inscription to an actress who had played Sadie Thompson. By 1930 there were only two such actresses. The first was Jeanne Eagels, who created the role on Broadway in 1922, toured with the show for two years, then returned with it to Broadway for another run of a year and a half. But Jeanne Eagels died in October 1929; obviously the photo was not inscribed to her. That leaves Gloria Swanson, who starred in the 1928 silent picture Sadie Thompson. 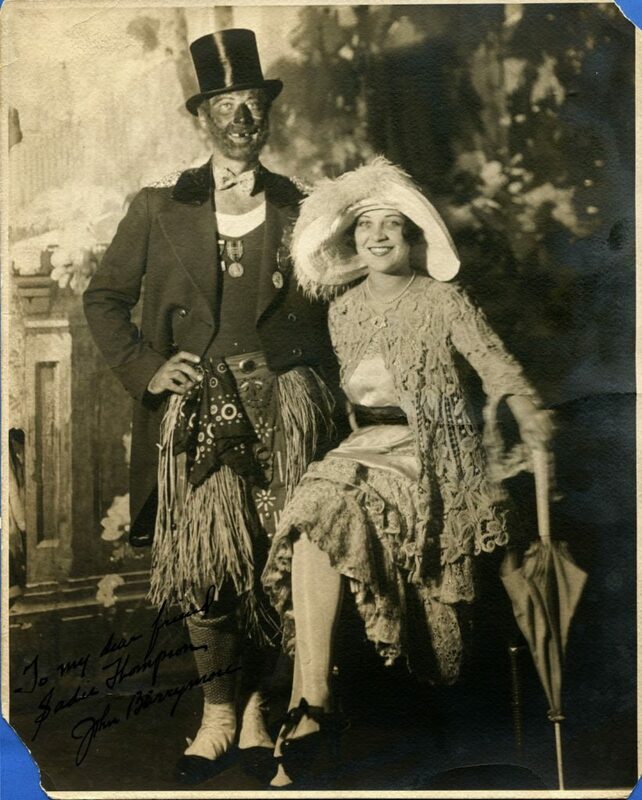 Was this photo a gift from Barrymore to his “dear friend” Gloria? Or did he have some other “dear friend” whom he identified with Maugham’s notorious good-time gal as a private joke? And the final mystery: Who is the woman in the picture? It’s not Dolores Costello, to whom Barrymore was married in 1930. Nor is it Gloria Swanson, America’s only living Sadie Thompson. Does anybody have any ideas? Comments and speculations are welcome. but it is not a picture of John Barrymore, nor of his autograph. idea who they actually are. forward to seeing you at Cinevent next year. Many thanks for getting in touch, Richard; I had a hunch — no, I knew — you’d be able to shed light on the subject. Now that I compare the pictures directly, I can see that the ears are wrong too. The picture remains a mystery, of course: Who are these people, and what — if anything — did they have to do with the Larchmont Yacht Club? Maybe New York socialites slumming as showbiz types for a party at the club? Wow – that is fascinating and you are quite a Sherlock Holmes! Perhaps this woman is dressed as Sadie Thompson for the costume party? At any rate, please find ou t who she is because now I can't stop thinking about it! "You've got me on a hunt now. His brother, Lionel, was in the movie Sadie Thompson with Gloria Swanson. Possible connection? Perhaps the Yacht Club has events records and/or guest lists? I would assume that people would have had to sign in to the club." Good catch about brother Lionel, Norma Jean! I suppose it's too much to ask that some member of the LYC is reading this now and has the time to look into the club's records…? When I first gave a glance at the picture, I could have sworn the man was Fred Astaire. I have no idea if he and Barrymore were friends, or anything. Maybe the woman is his dancing partner sister? Anyway, that first glance said Astaire to me. Ack! I was hoping they would be a notable couple with a deliciously saucy tale. However, they do look like fun people having a terrific time. It's a great photo!